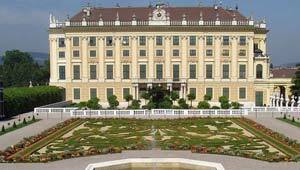 There’s no doubt that it’s one of the most important cultural monuments in Austria and ranks well against other European palaces like Versailles near Paris. The audio tour of the building is fascinating and the rooms seem to go on endlessly! There are two tours you can take, the first is the shorter “Imperial Tour” at 10.50 Euros including the audioguide which takes in 22 rooms. We’d recommend the longer “Grand Tour” though at 13.50 Euros including your audio guide (2012 prices) which takes in 40 rooms. There is also the Sisi ticket which gives you access to both Schonbrunn and the Hofburg in central Vienna. Outside, there’s plenty to see too with impressive gardens, packed with flowers in the summer months. Make sure you walk up to the summer house on the hill to get a great view. At Christmas there is often a large craft market at the front of the palace. For an extra special experience at Schonbrunn, there are a number of events you can attend to get the most out of your visit to Vienna: Latest Prices for Schonbrunn Tours & Experiences. Schönbrunn Palace is open daily from 8.30am, closing at 5pm in April, May, June, September and October, 6pm in July and August and at 4.30pm from November to March. It’s a short Metro ride from Vienna city centre. We could have spent an entire day here and it’s the place that sticks in our minds when we think of Vienna.